Explaining Japanese Geek Slang: "Babumi"
Recently on Japanese television, the anime slang babumi (バブみ) was introduced. For many, it was the first time they’d heard it. 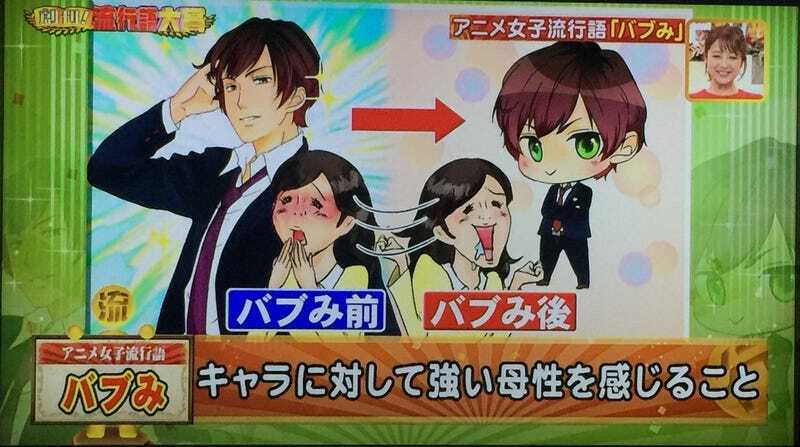 In the above image, the handsome guy on the left is “pre-babumi,” while the cuted up version on the right is “post-babumi.” So, what the heck is babumi? Babumi is not a new term. It’s been circulating predominately among female anime fans since around mid-2014. However, it has been used more widely of late. Babumi is used to express maternal feeling evoked by characters or certain situation. As Nico Nico points out, it’s typically seen between an older female character and a younger male one. Characters with infant characters also exhibit babumi. Note that there are exceptions and often gender as well as age do not matter. Or just sticking a pacifier in their mouths. In Nintendo’s Miitopia, this regressive-looking in-game item most certainly has babumi qualities. Physical interaction, such as certain embraces, can also express babumi. An unexpected offshoot of this slang is that the bath tablet brand “Babu” (バブ), which is actually short for “bubble,” keeps popping up on Twitter as a babumi pun.